We all know that I love insects. We also all know that I take my work home with me in a BIG way. I’ve got bugs everywhere – some real, some not. I buy a lot of insect stuff and display it around my home. (You know you’re an entomologist when someone says they weren’t sure they were at the right house until they looked down and saw the insect door mat!) I love to support insect artists. 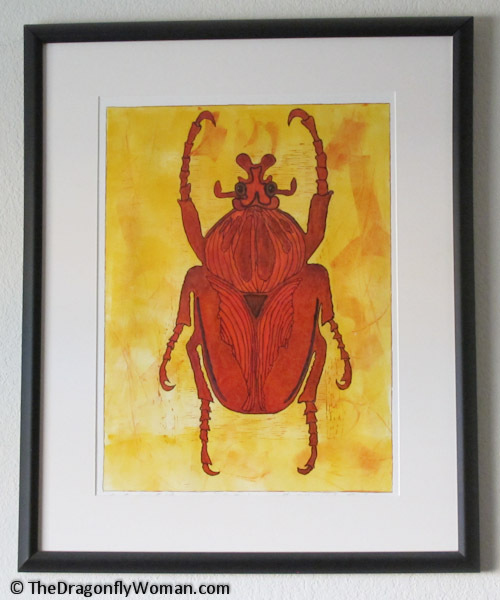 Today I’m going to share 5 pieces of insect art I have displayed in my home. My dad has always been obsessed with minerals. I practically grew up in a hole in the ground digging for smoky quartz. When I was young, we went to the Tucson Gem and Mineral Show religiously and I was thrilled to be able to go again when I moved back for grad school. The first year, I planned my purchases (I need to have a plan or I’m overwhelmed by choices) and was ready to find the perfect sulfur specimen to add to my collection. Instead, I walked away with the dung beetle sculpture pictured here. I found it hidden in a booth of carved stone from Zimbabwe, back behind sculptures of mothers and children and quartz elephants. I was beyond thrilled! It’s metal (I LOVE metal sculptures! ), came in two pieces (beetle + dung ball), and it was only $25. The dealer was surprised that someone actually wanted it and said that Americans don’t appreciate dung beetles like Africans do. He told me that they would be buried in elephant dung without their dung beetles, so the sculpture was an homage to a very important part of their lives. 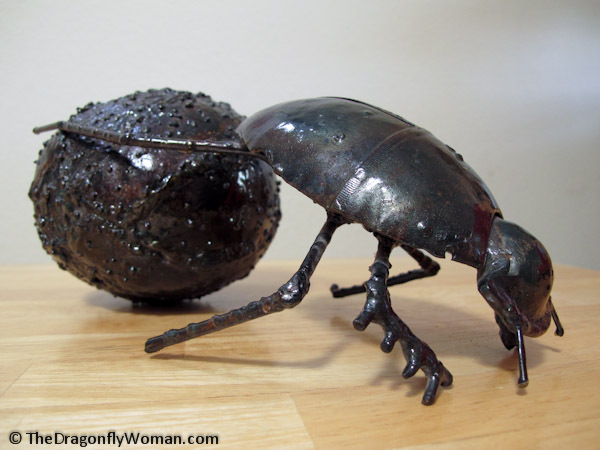 My dung beetle is still my favorite sculpture – and now I have two! Had to go back to the mineral show every year for 6 years to get it, but it was totally worth it. For several years, my art loving aunt from upstate New York spent a month in Scottsdale each January. Every year we’d spend a long weekend in the Phoenix area going to art galleries, shopping, and eating really good food. We have similar tastes in art and we fell in love with one particular gallery in Old Town Scottsdale. It was full of brightly colored art of many different types: sculpture, painting, fiber, jewelry. While my aunt debated whether to buy a $700 fiber piece, I perused the metal sculptures by William Wessel. The gallery had a really great one, a three-foot high piece with two damselflies flying among cattails. I coveted it, but it was $350, more than half what I was paid each month at the time. I wandered the store pondering the fact that I was too poor to buy it when I came across three of Wessel’s little sculptures. I was SO happy! They were only $35, a much more reasonable price for someone with my tiny budget. I had to choose between a mosquito, a damselfly, and a mayfly and walked away with the mayfly. Really, how many people sculpt mayflies? It makes my little sculpture so unique! I featured this one on my Friday 5 about insect artists that I love, but I just have to show it again. This is my favorite insect art piece I own! It’s one of a kind, brightly colored, and it’s a linoleum block print, my favorite medium. This was more expensive than most of the art pieces that I own and a huge pain to get home because I bought it at an Entomological Society of America meeting and couldn’t take it home on the plane. When I worked out the details for having it shipped to me by the artist, she told me that she would put my name on it right then it so she didn’t accidentally sell it to someone else (as she had done more than once in the past), so I worried that it wouldn’t ever arrive at my house. It eventually did, and then I spent $250 to have it framed. It was all completely worth it in the end though! It has the place of honor in my living room, the only thing on a big white wall that you see right when you walk in the front door. Love it, love it, love it! Very few of you will likely ever hear of this artist. Alex is one of my colleagues, a researcher at the University of Arizona. He’s obsessed with insects and photography and spends nearly all his free time outdoors collecting or photographing bugs. He’s my local photography expert, the person I go to when I have questions because he’s one of the few insect photographers I know that shoots Nikon. And I love his photographs! 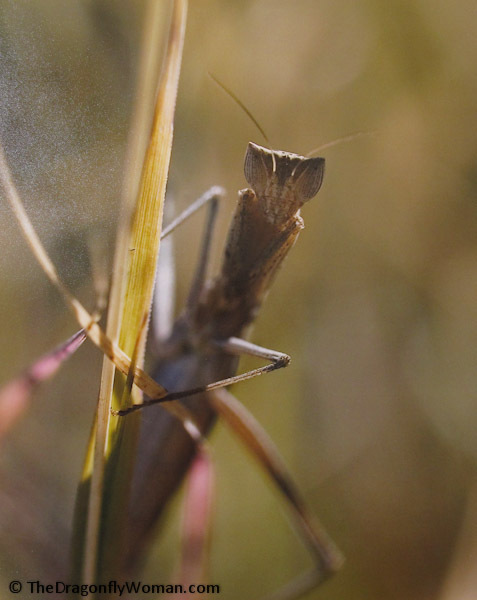 He had a little mini art show in the Department of Entomology office a few years back, and I bought the mantid photo shown here from him at the end of the show. It’s displayed in a corner of my house with several other insect photos and it makes me smile every time I see it. I’ve since bought a second photo (a stunning image of a dead tree in the Salton Sea – it’s so beautiful it brings tears to my eyes!) and I hope to buy some more in the future. I wish Alex would at share his photos online (or, even better, sell them!) because he’s so good – and hardly anyone knows it. Discovering the website Etsy was a bad, bad thing for me. I like supporting artists and I like to buy insect art, and there are a whole lot of both on Etsy! 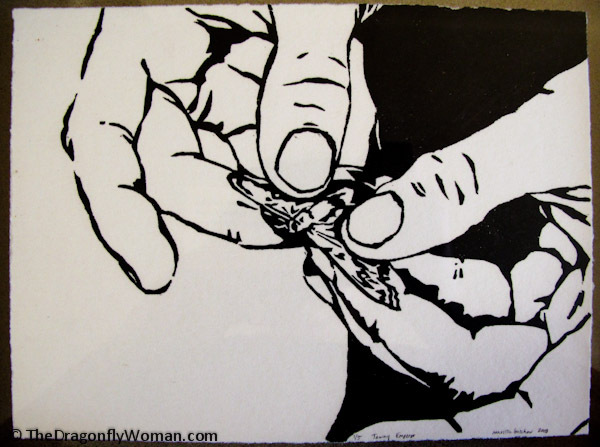 I spend way too much on Etsy… This was one of the first things I bought, a woodcut print featuring a person holding a butterfly. I can’t even explain why I like it so much, but there’s something about it that just works for me. Maybe it’s the way the butterfly is being held, gently enough that you know that it’s still alive and will remain alive after it is released. The print was a mere $18, but it’s always going to have a place on my walls. Having bug art me so happy! Insects are so beautiful and I want to share that beauty with others. Supporting artists is a good thing too. And buying insect art directly from the person who created it, so you can get the story behind the piece and learn all about the process, is a pure joy. I highly recommend it! Do any of the rest of you have insect art in your homes? If so, I’d love to hear about what you have. There’s even a handy-dandy comment section below to describe your awesome insect art. I look forward to hearing what you’ve got! I love your mayfly sculpture! I am just beginning to collect insect art, but I agree that insects are amazing creatures, tiny little creations by the ultimate artist. I have a grasshopper sculpture, about three inches long, made of metal. I have a silk scarf, covered with different colored dragonflies, its so beautiful, a dragonfly pin, and a dragonfly paperweight. I am especially drawn to dragonflies and mantises. Thank you for your newsletter, I really enjoy it. Ooh, dragonfly scarves are fun! I have one I got on my only trip to Canada – handmade, white silk with black dragonflies screenprinted on it. I love it! Your grasshopper scuplture sounds fun too. Glad you enjoy it! Hi-Just recently discovered your blog and love it! I love creating art with dragonflies and butterflies -its kind of a unique niche I am finding so appreciate it when I find find someone blogging about it! I have a shop on Etsy. I also in the past years have really discovered photographing dragonflies in Virginia and Florida so if you have have any tips on that too, would be most appreciated. Yea for Etsy! I love it. What’s your shop called? I’d like to look it up! I only have two tips for photographing dragonflies. 1) Be patient. If you want good photos, it really helps to pay attention to the behavior of the dragonflies and that requires time and patience as you figure out how they act and wait for the perfect moment. 2) Use the biggest telephoto lens you have! I stumbled onto this on my own through trial and error, but I have since learned that a lot of expert dragonfly photograhers use huge telephoto lenses and teleconverters. My lenses max out at 300mm, which isn’t quite as great as it could be, but it works well enough for now. Dragoflies are very skittish so the further away from them you can be while you shoot, the easier it is to take photos of them. Otherwise, practicing is the best thing to do! You’ll figure out what works best for you when you build up experience and figure out your own style. Good luck! Nice! I’ll have to take a look at your Flickr group! Thanks for the link. Maybe I’ll add some photos of my own insect art someday too! BTW, I love your watercolors. They are stunning! Thanks for the tips, I have found using a 300mm lens helpful to photograph dragonflies. I love stalking them, just wish they would choose decorative places to land! its kind of a hodge-podge of everything I like but my bugs are my favorite!